You've probably heard about the woman who has a habit/hobby of finding "smiley faces" in everyday objects. It's pretty adorable, really, and very likely to lift your spirits when you start to see the world smiling back at you. I dabble in this one, but my personal search is for accidental heart shapes. 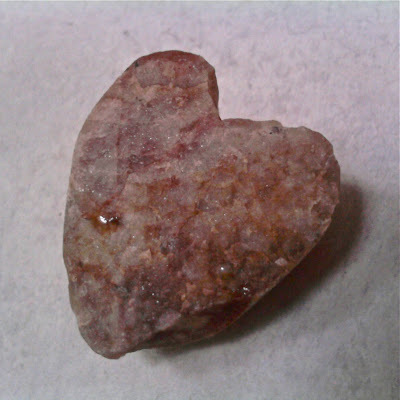 Lots of times they're rocks, like the one below, which I found here in the campground and gave to Rick for Valentine's Day. Other times they might be a cloud in the sky, a patch of moss, or some gnarled tree bark. Yesterday I spotted a looped piece of hair in the shower, shaped like a heart, reminding me yet again, that love, like smiley faces, can be found in the most unlikely places. All we have to do is look. I think they're like secret love notes from the Universe, and the more we watch for them, the better we are at finding them. Funny what you say about the heart shapes too, the other day I took off a 2-strand bracelet and dropped it on my bed, it fell into a heart shape !! It's like if you're making a pair of earrings and you get 2 ear wires out ready and sometimes they fall on your bead board opposite each other in the shape of a heart ! Nice !! Wow! Sunshine yellow, need my sunglasses for this....just wanted to say I ♥♥♥ your new luminaria beads! Love all of what you do. The Luminaria beads shine from within. Love, too, the reference to the lights of New Mexico (place of birth and where I lived for 18 years – lovely place). Yes, the luminarias are a thing of joy. #2.51 Ocean Dream is dreamy and I can imagine it in jewelry. #2.46 for the vines that are grounded by the foliage. Lakeside series #2.53 for the earthy colors - water of the sea, green for the foliage, and red for the sunset. Love the rings, too, as well as everything else. My favorite things – (1) a healthy life that is without drama, (2) my adorable companion cats, (3) and my joy in nearing retirement and looking forward to having energy for my own creativity.